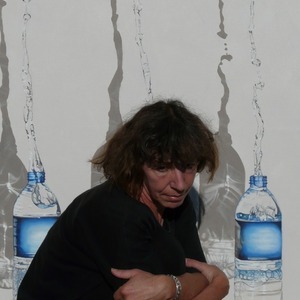 Sylvie Bayard, alias Sylvestre,was born in 1955 in Paris, she lives in Ardèche , France .Acrylic on canvas,installations. Actually, my work turn around society evidence like civilization, therefore culture facing up to nature, so to testify the upheavals witch result in. When geological time measure naturalness, human ascendancy is huge over time and space, and the very contemporary consciousness we have got with this flight means a new involvement, self centered like collective, so one must give evidence. My genuine wish is to show, describe, mankind and the way of the world, reflecting the emerging conscience. As figurative painting trends toward narration, when the art of showing is burdened with story telling. As for me, it could be a pleonasm, except for a deliberate will to relate the way of a sensitive and vital world, at the interface of men and nature. Salon Comparaisons , Paris 2008.Figuration Critique, espace Kyron,Paris 2009. Expo d'été, Usins à Zabu, 2009. Salon Comparaisons, Paris 2009.Artistes méridionaux, Toulouse 2009. Gréoux les Bains, expo d'été Narro 2010. Exhibition : " Anthropocène" , du 6 Avril au 26 Mai 2019, au Château d'Alba-la-romaine ,Ardèche,France.Private view : april 6th , 18.00H. Exhibition : Base'Art, 3,4,5 of June, espace Caquot, Fréjus (83) France.Private view june 2nd.